What does HTC Evo 3D, HTC Sensation, HTC Flyer, Samsung Galaxy Tab 10.1, Galaxy Tab 8.9, PLDT TelPad, Sony Xperia Ray and the RiM BlackBerry PlayBook have in common? They, including a lot more gadgets, are all present and accounted for in Smart’s newest Jump Experience Center – an interactive experience for everything Smart and PLDT related. On display and available to try are some of the world’s latest gadgets and you can only check them out here. The Jump Experience Center is located at SM Megamall Cyberzone and you can visit them anytime to find out more about your favorite products. In this video we check out some of the most popular consumer tech gadgets around – including the glasses free 3D capable HTC Evo 3D. Below is a video montage of the gadgets we tried there – with a lengthier bit for the 3D sensibilities of the HTC-branded phone. The 3D effect on our eyes was instantaneous and we didn’t have to squint or position the phone in a specific way except for switching to landscape view. In a sense, the 3D was comfortable to see. 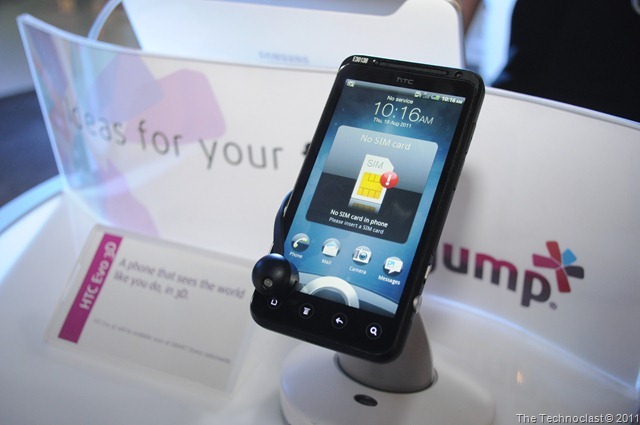 The HTC Evo 3D will be available in an exclusivity deal (probably timed) with Smart and you can check it out, and other gadgets, at the Jump Experience Center in Megamall, Ortigas. No prices or release dates have been mentioned, but it shouldn’t be too long now. In the meantime, you can visit here and try out these gadgets yourself! Check out the gallery below to catch a glimpse of the devices you can find there! HTC is trying to catch up, their getting more competitive everyday.